Walking around town at all hours of the day, I expect to see new things in random places. I'm one of the first to notice when a neighbor does something to their property like adds new lights or has a bit of fun with landscaping. I'll notice when a new car shows up, or a business gets ready to open before most will. It's all a part of getting out and exploring your environment. Get out, enjoy the world, and see what is around you. It's a requirement when you have a dog. If you don't take your dog for a walk, frequently, more than once a day, you'll have behavior problems, guaranteed. Besides, you could use a little time up from the keyboard or the couch. I know I could. This particular morning, my body woke me up at 5AM. Just like a Swiss Watch, I'm up at 5. I have no explanation for it other than I started getting up early when I was competing on inline skating races in Philadelphia and the habit stuck. Throwing on clothes, the dog's harness, and loading my pockets with bags and other needed things, I entered the predawn darkness. We walked through the regular places in our regular routes when we came upon the Gables Wilton Park. A rather large and well kept upscale apartment community here in Wilton Manors. It has always looked as I would expect an apartment complex to be for what it is, and how it is marketed. The buildings are immaculate, the plantings are interesting, and the grounds are clean. Pretty much like you'd expect. They have much the same plants you see everywhere in South Florida, and set in the gardens in pretty much the same manner. Low maintenance, and I would expect low water use plants, kept in neat rows so that maintenance workers can get to everything. I couldn't but I'm quite a lot taller than your average landscaper. 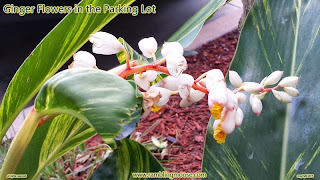 One of the things that was planted was some ornamental ginger. I don't know if the stuff is edible, but it is the same plant that goes into my cookies when I make ginger snaps. I'm used to seeing them all over town. They're a pleasant plant for ornamental use, they don't seem to spread, they don't overgrow, they're not invasive, and they're about knee high. What I didn't expect was the flowers. I've never seen them bloom before. I guess I'm still getting used to being in South Florida and the tropics, but this just struck me as being a bit novel. Not odd, simply new. The flowers weren't overly scented, my own weak nose didn't smell anything at all. They weren't large, the inflorescence was about the length of your hand. Just novel. A nice change of pace. I made sure that Rack didn't water them himself, and we wandered on about our business making a mental note to get a picture of the things later when the light was better. So that's what your ginger looks like before it gets turned into snaps. Tasty!